NNA 2013 Conference is offering a complete package of workshops and events for all Signing Agents — from new Notaries seeking NNA certification to veteran NSAs looking to expand their business. As part of the “soup to nuts” experience, NNA 2013 attendees will be able to complete the education necessary to become an NNA Certified Notary Signing Agent. Texas Notaries also will be able to undergo background screening and take the Texas state exam at Conference. Notaries from other states will go home trained and confident, ready for the exam required by their own state. Veteran NSAs will be able to take advantage of a number of events, including workshops on new income opportunities, managing difficult signers, marketing techniques and getting the most out of social media. The General Session, entitled “Notary Signing Agent 2.0” will provide important details about new industry requirements and what you need to know about complying with government regulations. A workshop on avoiding liability pitfalls will teach you how to protect yourself by complying with laws and following best practices. This unprecedented opportunity to learn new skills and advance your career has been designed to provide the training and education that will satisfy the changing world of loan closings, and meet the increased demand for NSAs in the recovering housing market. New Notaries will discover the potential that becoming a signing agent offers, and existing NSAs may find new opportunities with the lenders or title companies represented. 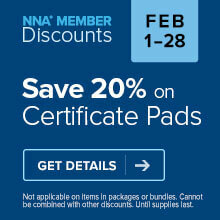 Don’t miss out on this great offering.. For more information, visit NNA 2013 Conference website.